I know what you're thinking. "Boy, I wish I could use my iPad to control my Xbox 360." What's that? You're not thinking that at all? You just want to play video games? You don't care about ridiculous control schemes or hardware gimmicks? Well okay then. At least this one's free: Microsoft released a new update last night for the iPad's My Xbox Live app that allows you to use your tablet as sort of a makeshift remote control for your console. I played around with the new update this afternoon, and it works as promised: once you link your iPad to your 360, you'll be able to use it to navigate the dashboard, select games, and control media. Sadly, it doesn't seem you can use the app to play any games. I loaded up Minecraft and Spelunky, neither of which would let me use the iPad's ugly virtual controller (below) to play. But that might be possible soon enough: when Microsoft releases Smart Glass, we'll indeed be able to use our iPads to interact with games. 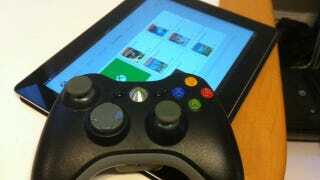 For now, it's neat to be able to use your tablet to control your Xbox, although I can't see myself doing that much. It's a novelty. A free novelty.